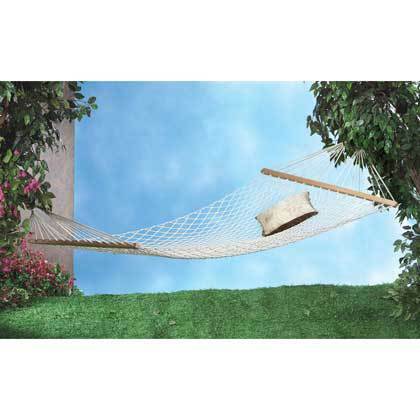 TWO-PERSON HAMMOCK home decor, jewelry, decor, decorations, electronics, fountains, floor mats, art glass, vases, garden essentials, fireplace screens. 100% cotton rope on a wood frame, metal loops for hanging. Max. Wt. : 440 lbs. Material(s): COTTON METAL. Weight: 7 pounds. Dimensions: 54" x 140" long.